I'm not going to rate this. The writing isn't bad. Sort of what I call generic American male trying to sound gritty. Grammar and sentence structure are fine, if a little on the amateur side. Sentences too long etc. What made me put this down was the rank ignorance of the subject matter. I expected the cannibalism. It's supposed to be Horror after all. I might have been able to eventually reconcile that a circus troupe was traveling around in a tour bus like a rock group. Sort of. Camping in tents? A real circus takes a whole civilization with it. Train or truck cars for dressing rooms, etc. And no one can live in clown make-up 24/7, the skin has to breathe. 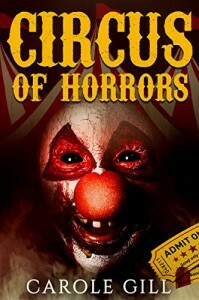 The real death knell was the second time the author referred to circus people as carnies. Once could have been a typo, but the second time was emphasized as if she knew what she was talking about. Circus people are not carnies! Carnival people are carnies and they are definitely not interchangeable.